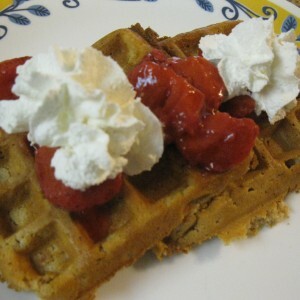 The whole family liked this variation on waffles. It doesn't take many to fill up and they pack a flavor punch. In a mixing bowl, thoroughly mix the dry ingredients: oat flour, baking powder, salt and cinnamon. In another bowl, thoroughly mix the wet ingredients: milk, melted coconut oil or butter, eggs, maple syrup and vanilla extract. Pour the wet ingredients into the dry ingredients. Stir with a big spoon until just combined (the batter will still be a little lumpy). Let the batter rest for 10 minutes so the oat flour has time to soak up some of the moisture. Plug in your waffle iron to preheat now. Once 10 minutes is up, give the batter one more swirl with your spoon. Cook batter on waffle iron. Once the waffle is deeply golden and crisp, transfer it to a cooling rack or baking sheet. Don't stack your waffles on top of each other, or they'll lose crispness. This can be gluten free - depending on your oats. I tried the recipe purely to explore other flours and because I've been itching to use the oat flour that I made in my electric mill.